Assailed in this Petition for Review is the Decision of the Court of Appeals declaring respondent Rosalinda M. Torres constructively dismissed and awarding her separation pay. Petitioner Chiang Kai Shek College is a private educational institution. Individual petitioner Carmelita Espino is the Vice-President of the school. Respondent Rosalinda Torres had been employed as a grade school teacher of the school. Respondent was accused of leaking a copy of a special quiz given to Grade 5 students of HEKASI. Petitioners came to know about the leakage from one of the teachers of HEKASI 5, Aileen Benabese (Ms. Benabese). Ms. Benabese narrated that after giving a special quiz, she borrowed the book of one of her students, Aileen Regine M. Anduyan (Aileen), for the purpose of making an answer key. When she opened Aileen’s book, a piece of paper fell. Said paper turned out to be a copy of the same quiz she had just given and the same already contained answers. Ms. Benabese informed the school’s Assistant Supervisor Mrs. Gloria Caneda (Mrs. Caneda) about the incident. Mrs. Caneda conferred with Assistant Supervisor Encarnacion Koo (Mrs. Koo), who was in charge of the HEKASI area, and Supervisor Luningning Tibi (Ms. Tibi). Mrs. Koo confronted respondent, who had initially denied leaking the test paper but later on admitted that she gave the test paper to Mrs. Teresita Anduyan (Mrs. Anduyan), her co-teacher and the mother of Aileen. Respondent and Mrs. Anduyan were both directed to submit their written statement on the incident. Respondent submitted her Comment. She insisted that Mrs. Anduyan asked her to see the special quiz. She was not aware that Mrs. Anduyan did not return the copy of the special quiz back to her. The Investigating Committee held a meeting and found respondent and Mrs. Anduyan guilty of committing a grave offense of the school policies by leaking a special quiz. According to petitioners, their Investigating Committee had actually decided to terminate respondent and had in fact prepared a memorandum of termination, but in a short letter respondent allegedly pleaded for a change of punishment from termination to suspension and that she will be resigning at the end of the school year. Respondent filed a complaint for constructive dismissal and illegal suspension with the Labor Arbiter. She also sought payment of unpaid salary, backwages, holiday pay, service incentive leave pay, 13th month pay, separation pay, retirement benefits, damages and attorney’s fees. The Labor Arbiter Eduardo J. Carpio dismissed respondent’s complaint for lack of merit. The Labor Arbiter deemed respondent’s suspension coupled with petitioner’s allowance of respondent’s resignation at the end of the school year as generous acts considering the offense committed. The Labor Arbiter held that there was no constructive dismissal because respondent was not coerced nor pressured to write her resignation letter. On appeal, the Second Division of the NLRC rendered a Decision affirming the Labor Arbiter’s findings but ordering petitioners to pay respondent separation pay equivalent to one-half (1/2) month salary for every year of service on the grounds of equity and social justice. Respondent elevated the case to the Court of Appeals. The Court of Appeals reversed the NLRC Decision and ruled that petitioner did not voluntarily resign but was constructively dismissed. Petitioners moved for reconsideration but it was denied. Hence, this petition for review. Was respondent Rosalinda Torres constructively dismissed? The school’s act of imposing the penalty of suspension instead of immediate dismissal from service at the behest of the erring employee, in exchange for the employee’s resignation at the end of the school year did NOT constitutes constructive dismissal. Resignation is the voluntary act of an employee who is in a situation where one believes that personal reasons cannot be sacrificed for the favor of employment, and opts to leave rather than stay employed. It is a formal pronouncement or relinquishment of an office, with the intention of relinquishing the office accompanied by the act of relinquishment. As the intent to relinquish must concur with the overt act of relinquishment, the acts of the employee before and after the alleged resignation must be considered in determining whether, he or she, in fact, intended to sever his or her employment. We do not find anything irregular with respondent’s handwritten letter. The letter came about because respondent was faced with an imminent dismissal and opted for an honorable severance from employment. That respondent voluntarily resigned is a logical conclusion. Respondent’s infraction and the inevitable and justifiable consequence of that infraction, i.e., termination of employment, induced her to resign or promise to resign by the end of the shchool year. Given the indications of voluntary resignation, we rule that there is no constructive dismissal in this case. There is constructive dismissal when there is cessation of work, because continued employment is rendered impossible, unreasonable or unlikely, as an offer involving a demotion in rank or a diminution in pay and other benefits. Aptly called a dismissal in disguise or an act amounting to dismissal but made to appear as if it were not, constructive dismissal may, likewise, exist if an act of clear discrimination, insensibility, or disdain by an employer becomes so unbearable on the part of the employee that it could foreclose any choice by him except to forego his continued employment. There was here no discrimination committed by petitioners. While respondent did not tender her resignation wholeheartedly, circumstances of her own making did not give her any other option. With due process, she was found to have committed the grave offense of leaking test questions. 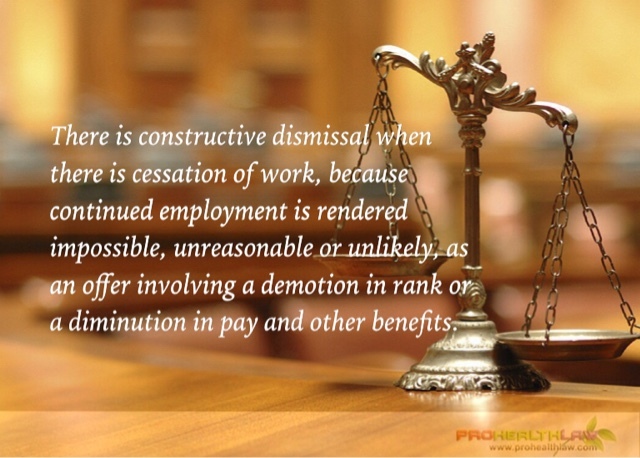 Dismissal from employment was the justified equivalent penalty. Having realized that, she asked for, and was granted, not just a deferred imposition of, but also an acceptable cover for the penalty. CHIANG KAI SHEK COLLEGE and CARMELITA ESPINO, Petitioners, vs. ROSALINDA M. TORRES, Respondent.